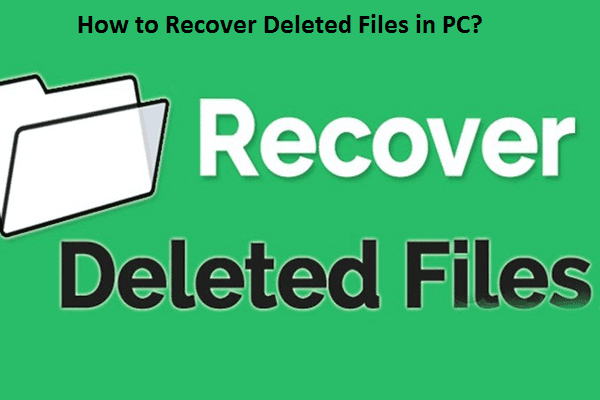 How to Recover Deleted Files in PC? Home / Technology Tips / How to Recover Deleted Files in PC? Technology has helped us in so many ways. One big way it has helped us is through computers and the internet. We can store a very large amount of data in a single computer’s memory. However, we have not reached the point where we can store infinite data. Because of the limited memory of computers, we have to delete files we may not need. The problem is that we may need the deleted file at a later point in time. There are situations when people click on ‘Shift+Del’ by mistake to remove files (documents, photos, audios, videos, etc.) from their PC which permanently deletes the files from the system’s hard drive. It could be disastrous when you accidentally delete the significant file(s) using ‘Shift+Del’ keys. This is quite a common issue, and you are not alone in such a situation. At some point in time, most of us have experienced this critical data loss situation. Moreover, there are some other factors which may lead to permanent data loss in PC. What causes permanent data loss in a PC? A corrupt file or bad sectors on the system’s hard drive. No need to worry about how to recover deleted files in PC. It can be done through various easy and simple processes nowadays, as long as the files are not overwritten. The System Restore feature is a very powerful feature in Windows. It allows you to reset your computer to a state it was in a few days ago. By this method, you can get back the files you deleted. To use this feature, do the following. Go to Start and then look for System Tools. The System Restore tab is what you are looking for. Then, press the continue button. If you had put a password lock, type in the password. Click Next. Then, choose the best Restore point or date. The date should be such that the original file must still be there. However, it must not be so old that important system updates also get rolled back. Stellar Data Recovery software is a one-stop solution for any data recovery need you may have. The software allows you to recover files from your desktop or even external hard drives. It also helps with recovering data from damaged, formatted, deleted, lost and hidden partitions on any device. The software is able to recover data even when the operating system crashes. To know about the software you can follow the steps mentioned below. · Download, install and launch the data recovery software. · On the main screen, select the type of data that you want to recover. · Then choose the desired location to start the scanning, under “Select Location” screen. · Next, click scan. The software will scan the selected volume to search for the specific type of data. · Then, preview the scanned files. · Click recover to save the desired files at the preferred location. There are many cases where all of the above methods will not work. If you are facing such a problem, do not worry. Your data may still be recoverable. Just go for the help of experts in the field of data recovery. There are many data recovery service companies today, but be wise while choosing data recovery service providers. Stellar data recovery is one of the most trusted and recommended data recovery service provider. They provide safe and secure data recovery services. These experts with decades of experience would know exactly how to get back your data. Best of all, your data would be secure and private. The ratio of accidental deletion of data is very high, and it is increasing day-by-day. The reason for deletion can be anything; however, the worst part is your data loss. When such a situation arises, the immediate need of the hour is of data recovery. And when it comes to recovery of deleted files in PC, nothing can beat the most trusted and reliable Stellar Data Recovery software or services. For more information about Stellar data recovery visit their official website or dial their toll-free number 1800-102-3232. Hope you enjoyed the article? Do share with friends and leave your comments if any questions.